- CARL NIELSEN (1865-1931): 3 Piano Pieces, Op. 59 (Arne Skjold Rasmussen rec. 1952), Preludio e Presto for Solo Violin, Op. 52 (Peder Elbæk 1979 DG LP), The Fog is Lifting from The Mother, Op. 41 (Holger Gilbert-Jespersen [flute], Valborg Poulsen [harp] rec. 1937), Fantasay Pieces, Op. 3 (Svend Christian Felumb [oboe], Christian Christiansen [piano] rec. 1937), KNUDÅGE RIISAGER (1897-1974): Qarrtsiluni, Op. 36 (Royal Danish Orchestra; Johan Hye-Knusen. rec. 1941), Serenade, Op. 26b (Gilbert-Jespersen [flute], Erling Bloch [violin] rec. 1937), VAGN HOLMBOE (1909-1986): Sonata for Solo Flute, Op, 71 (Poul Birkelund 1970 Icelandic Radio recording), NIELS VIGGO BENTZON (1919-2000): Chamber Concerto for 11 Instruments, Op. 52 (Bentzon, Georg Vásárhelyi, Herman D. Koppel [pianos], Collegium Musicum Copenhagen; Lavard Friisholm rec. 1951), Toccata for Piano, Op. 10 (Bentzon rec. 1942), Piano Sonata No. 3, Op. 44 (Bentzon rec. 1949), ERIK HØJSGAARD (b.1954): C’est la mer mêlée au soliel for Guitar (Niklas Johansen new recording), J.P.E. HARTMANN (1805-1900): Fly bird, fly and EDOUARD DUPUY (1770-1822): Romance from Act 1 of Youth and Folly (Otta Brønnum [soprano] rec. 1898 - yes 1898! ), FUZZY (b.1939): Cadences et tremblements à Notre-Dame (Grethe Krogh [organ of Notre-Dame Cathedral rec. 2002), HARALD SÆVERUD (1897-1992): Rondo amoroso, Op. 14/7, Ballad of Revolt, Op. 22/5 (Robert Riefling [piano] rec. 1950), ARNOLD SCHOENBERG (1874-1951): 6 kleine Klavierstücke, Op. 19 (Bentzon rec. 1949), PÁLL ÍSÓLFSSON (1893-1974): 2 Humoresques (Harladur Sigurdsson [piano] rec. c.1935), ASGER LUND CHRISTIANSEN (1927-1998): Concertino for Trombone and Orchestra (Palmer Traulsen [trombone], Tivoli Concert Orchestra; Asger Lund Christiansen rec live 1957), PER NØRGÅRD (b.1932): Arcana for Accordion, Guitar and Percussion (Trio Mobile 1984 Point LP), PELLE GUDMUNDSEN-HOLMGREEN (1932-2016): Triptykon for Percussion and Orchestra (Gert Mortensen [percussion], Royal Danish Academy of Music Symphony Orchestra; Michael Schønwandt. 2016 RDAM Gala Concert). Description: In addition to the above there are many Dacapo recordings, all of which we’ve offered over the years by Danish composers Niels Gade, J.P.E. Hartmann, Holmboe, Finn Høffding, Herman D. Koppel, Leif Kayser, Svend Westergaard, Ib Nørholm, Jørgen Jersild, Nørgård, Hans Abrahamsen, Niels Rosing-Schow and Bent Sørensen. There’s also a good deal of standard rep - mostly chamber music - performed by faculty members of the RDAM (mostly in historical recordings from the 1940s and 50s although there’s also a c.1929 Deutsche Ultraphon test pressing of Henry Holst playing Sarasate’s Zigeunerweisen with “Gypsy Orchestra”!). 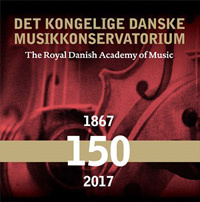 Complete with a 128-page booklet with multiple articles in English and Danish, this is a more than fitting memorial to the first 150 years of this august Danish institution, and at $1.40 a disc! 12 CDs.